So, your young one wants to start riding dirt bikes. This could be a moment of panic or elation or a combination of both for you. Perhaps your first thought was "How do I choose the right dirt bike for my kid?" A great question and one we hope to help guide you to the right conclusion. But first, in order to answer that question you'll need to answer a few more questions. Who or what influenced them to ride? What age is appropriate for kids to learn how to ride small dirt bikes? How young is too young to begin riding? Can younger kids completely comprehend safety concerns? Should you enroll your kid in a riding class? Do kids have an advantage at learning to ride when they start at an early age over kids who do not get started until they are older? What size bike is a good choice for beginners? Should younger kids participate in competitions? The answers to these questions are really up to you - there are no right or wrong answers. Every kid is different and you know yours best. Was it Dad who influenced the racing gene, a buddy down the street or is it the popular sport of the moment that everybody is involved in and you think it might pass? Does your child tend to stick to things or does he or she have more of try it once personality and move on? Are they fearless? Your five year-old may be ready but a neighbor's kid the same age is not and vice versa. Some kids have natural riding gifts others need extensive instruction. Answering these questions should help guide you in determining how deep, financially and time wise, you want to get into this hobby and how serious you think your child is. Choosing the right starter bike goes beyond just buying the right bike. Other factors like where your child rides as well as your ability to invest in riding gear all factor in to getting the right bike for your kid. Look for a used dirt bike. A brand new dirt bike, even kids sized, can be expensive. Try contacting local clubs or others you meet in the dirt biking community and buy a used bike. If your child decides weekends on the track is not for them after a first crash or they don't want to invest in the time involved in learning to ride then you won't be out a whole lot of money. Choose a bike that fits. Kids need easy manageability. This includes being able to sit on the bike and reach the ground with both feet securely, and reach the handlebars and controls with ease. Upgrading to a larger bike with a manual clutch may work for some kids sooner than for others but remember not to push it. Finally, test ride whatever beginner dirt bike you look at - new or used. Your child may find the 50cc size is too small but a 100cc is too big, then you'll know to look at the 70cc and 80cc range. Once shopping starts, you'll notice a number of brands offering beginner dirt bikes for kids. Again, don't be subject to the brand your child's hero rides, even if it's the smaller version. The best starter dirt bike, regardless of brand, is the one your kid can sit comfortably on and handle the power. The smallest engine is 50cc and as your child graduates and improves on skills you can decide on a variety of bigger engine sizes with reasonable and manageable power: 65cc, 70cc, 85cc, 100cc, 110cc and 150cc. Save the popular 250cc engine for much later. 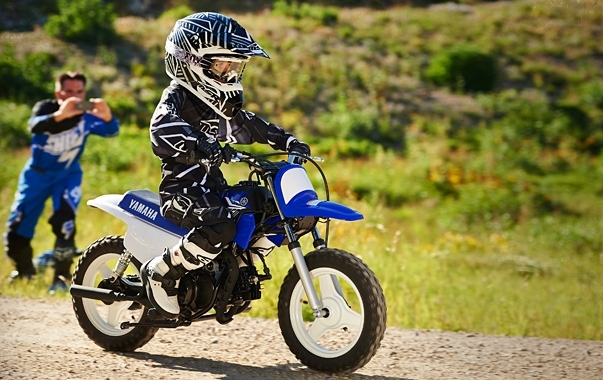 The Yamaha PW50 is a small 2-stroke engine ideal for very young children just starting out. It's fully automatic. Honda also makes a popular beginner bike in the CRF50. It's a well-built 4-stroke and even new ones are light on the pocketbook. Kawasaki and Suzuki also make inexpensive and reputable smaller engine dirt bikes in the 100cc range. KTM makes a 50cc engine and is considered more of a top-of-the-line dirt bike. If you and your child are not yet ready to fully invest in riding this bike is probably not for you...at least not yet. 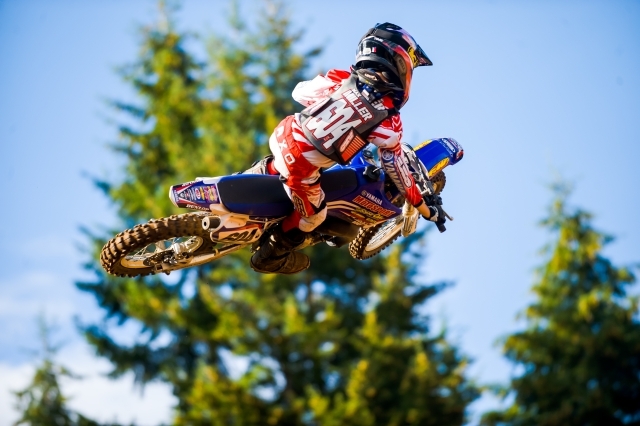 Dirt bikes for kids sometimes carry features like automatic liquid cooled transmissions but typically the more accessories the higher the price tag. So, for example, deciding on an automatic or manual clutch depends on how quickly your son or daughter handles more complex tasks. The technical aspects of powering a dirt bike range from the easy (just a throttle) to more advanced functions (throttle, foot pedal gear shifter and handlebar clutch) all operating in together. Sticking with a name-brand dirt bike is a wise choice especially when buying used. Knock-offs typically do not provide the reliability and toughness that the factory machines give. Crashing is inevitable. 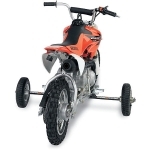 Your child needs a dirt bike built well enough to handle what he or she will undoubtedly put it through. If your child is interested in riding dirt bikes then he or she has likely spent time on a pedal bike. Most kids start out on pedal bikes using training wheels and, yes, training wheels for dirt bikes exist. Equipping your child's dirt bike with training wheels offers the same advantage as training wheels on a regular pedal bike. 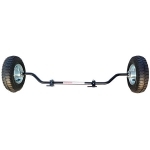 Dirt bike training wheels give stability and control until your child is really ready to ride. Training wheels also reduce the chance of a serious tip-over crash that may damage confidence and turn your child off from riding altogether. 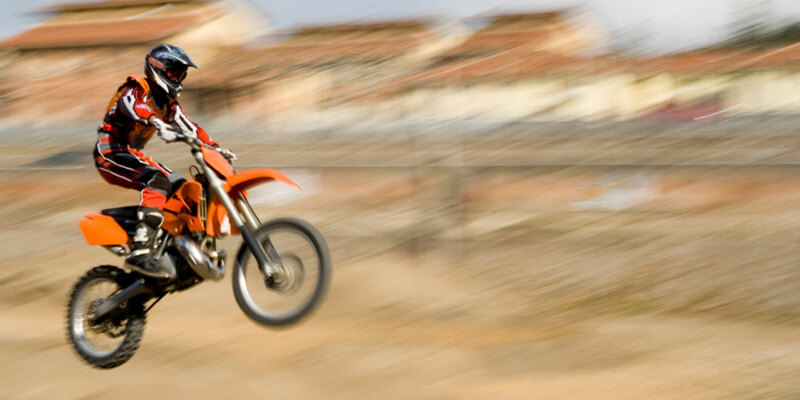 Getting your child's confidence on the dirt bike is essential in maintaining the hobby. The other option to consider is a manual or automatic clutch. As stated previously, your child's ability to learn is a factor. An automatic clutch may prove beneficial so your child can work on the necessary fundamentals of riding and staying upright before moving on to the more complex aspects of dirt bike riding. The fun of dirt bikes is you can pretty much ride them anywhere. Motocross tracks, mountain trails, desert sand dunes and wooded areas all provide a fun and exciting assortment of obstacles, twists and turns. Where you ride often depends on where you live. Many communities have public tracks and courses open to the public for a fee. These tracks provide the best opportunity to race and meet other riders in the same situation as you. Additionally, you may find at least one veteran willing to provide tips and advice to your child during the training period. If you are not a rider and therefore unable to provide the necessary instruction, taking advantage of local clubs and tracks for help and assistance is a smart decision. The one thing you definitely want your child to emulate about their heroes is all the gear they wear. Helmet, chest protection, boots, knee braces, gloves and goggles are necessary investments to your child's dirt bike riding adventures. Approach dirt bike riding gear for your child the same way you approached buying the bike with the exception of buying used. We'd recommend new gear unless you're comfortable using a hand-me-down from a family member or close friend who you trust. Even a small crash can damage and impair the quality of gear - especially a helmet. Like dirt bikes, you can buy affordable riding gear that won't break the bank and protects just as well as more expensive higher-end products. With that in mind, the best dirt bike riding gear for your kid fits well, is comfortable and doesn't inhibit their ability to ride. 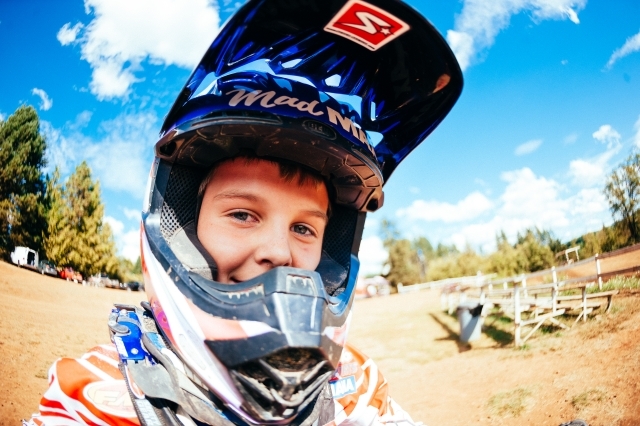 Before you buy a helmet, check out our Dirt Bike Helmets for Kids Buying Guide. As you can see, choosing the best beginner dirt bike for your kid requires thought and research. You can help narrow the focus but let your child make an informed decision. Including him or her in the process is a great way to foster their investment in the sport. Besides, they are the one riding so they'll tell you what bike feels uncomfortable or too powerful.